Further to our award success, our manager was invited to go to Perth FM for a live radio interview. This was a great opportunity and was of course willingly accepted. Perth FM is a local radio station committed to serving the community as best it can hence it giving opportunities to local groups to get this airtime. You can hear the results of this broadcast by clicking here. 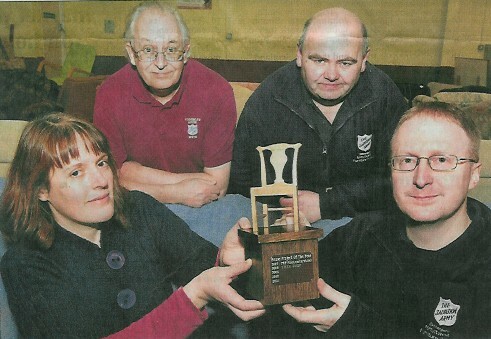 Following on from being named “UK Furniture ReUse Organisation of the year 2009” by the UK Furniture ReUse Network, Perth Salvation Army’s “4020” Furniture Re-Use Project has now received further recognition from The Salvation Army’s UK Territory. At its annual Social Services Awards ceremony held at the Hayes Conference Centre, Derbyshire, the stars of Salvation Army social services work, who go the extra mile to help homeless and older people, were given the spotlight by the church and charity organisation. 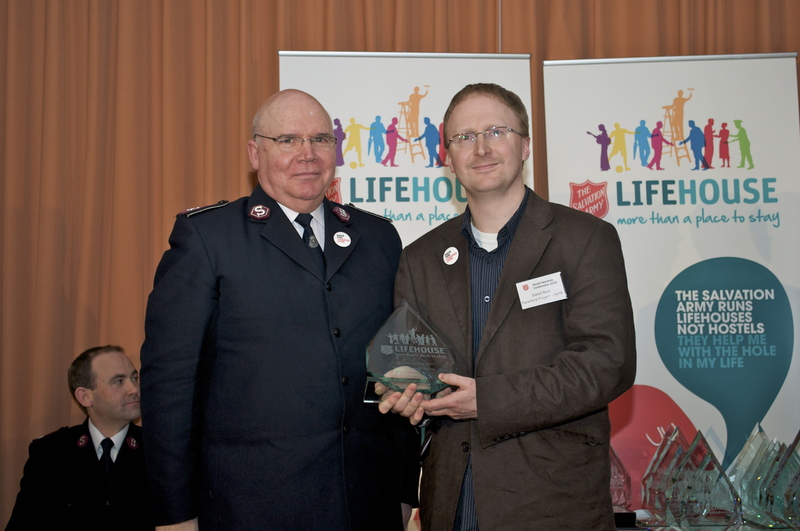 Normally unsung champions in homelessness services and older people’s services received awards from The Salvation Army’s Territorial Commander Commissioner John Matear, in a ceremony at the church and charity’s annual social services conference, compered by Lieut-Colonel Ian Barr (Secretary for programme) and Major Ray Irving (Director of social services). Winners from across the UK and Ireland were cheered on by an audience of over 300 social service directors, centre managers, project workers, and service users. Judged by an independent panel of experts in the older people and homeless sector, 97 Salvation Army homeless services (that include 83 LifeHouses), 17 care homes and three day care centres for older people, and more than 1,000 staff in the UK and Republic of Ireland were eligible for nomination by Salvation Army employees, service users, and by independent local community groups in 16 award categories. The Furniture Reuse Network of furniture charities that collect unwanted furniture to pass on to those in need announced the winner of the third President’s Award for the most outstanding charity in the network at their Annual Conference held in Cheshire this weekend . “The Salvation Army’s furniture project in Perth is a shining example of the original values of the FRN; a local community initiative which values its people as well as the furniture reuse work to alleviate poverty”. The team of staff and volunteers led by Daniel Rous have worked amazingly hard in 2009 to help as many people as possible and put the furniture project on a firm footing. The Award will give the Perth team a boost to know that they have the accolade of their fellow members in the FRN and that this recognition will raise their profile locally to bring in more furniture, volunteers and help to secure funding. The FRN is a UK networking charity representing approximately 400 reuse organisations. nominations were put forward by FRN staff and key people in the sector acting as scouts; The team of judges comprised the President and two previous winners of the Award.“ All nominations are high achieving projects who had made a big difference to the communities they serve” they added.. Judges focussed their decision this year on the project that balanced the social benefits of reuse with the environmental advantages. As part of commitment to providing as wide a service as possible to the Perthshire community, we are pleased to offer a number of additional services. So, not only will we collect all useable furniture and electrical items for free, and sell those items on at very low prices, but now we can offer Portable Appliance Testing and Basic Manual Handling Training. More additional services are planned so watch this space for more details! For now, head over to our extra services page to find out more. You are currently browsing the archives for the The Salvation Army category.